"Capital Beltway" redirects here. For other uses, see Capital Beltway (disambiguation). Interstate 495 (I-495) is a 64-mile (103 km) Interstate Highway that surrounds Washington, D.C., the capital of the United States of America, and its inner suburbs in adjacent Maryland and Virginia. I-495 is widely known as the Capital Beltway, or simply the Beltway, especially when the context of Washington, D.C., is clear. It is the basis of the phrase "inside the Beltway", used when referring to issues dealing with American government and politics. I-95 utilizes the southern and eastern half of the Capital Beltway to circumnavigate Washington, D.C., and is cosigned with I-495 along that portion. 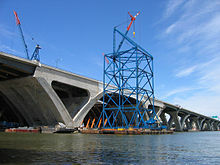 This circumferential roadway is located not only in the states of Virginia and Maryland, but also crosses briefly through the District of Columbia, near the western end of the Woodrow Wilson Bridge over the Potomac River. The Beltway passes through Prince George's County and Montgomery County in Maryland, and Fairfax County and the independent city of Alexandria in Virginia. The Cabin John Parkway, a short connector between I-495 and the Clara Barton Parkway near the Potomac River along the Maryland–Virginia border, is considered an Interstate spur (I-495X) by the Maryland State Highway Administration. Except for the westernmost part of Woodrow Wilson Bridge south of downtown Washington (the water below is considered part of the District of Columbia), the Capital Beltway encircles Washington, D.C., in adjacent Maryland and Virginia. The two directions of travel, clockwise and counterclockwise (looking at a map), have become known respectively as the "Inner Loop" and the "Outer Loop". The route descriptions below follow the direction of the Outer Loop, starting at the Woodrow Wilson Bridge over the Potomac River, south of Washington. Most Beltway interchanges provide access to Washington, with I-95 and I-295 from the south, I-66 from the west, and US 50 from both the west and the east among the most frequently used. More scenic routes from the Beltway into the District are offered by the George Washington Memorial Parkway along the Virginia side of the Potomac, the Clara Barton Parkway along the Maryland side of the river, and the Baltimore-Washington Parkway, approaching Washington from the northeast. Originally, the entire Beltway was simply I-495, and I-95 was planned to serve downtown Washington, D.C., from the south and north, intersecting the Beltway in Virginia and in Maryland. However, environmental litigation stopped completion of this plan, and the built portion of I-95 inside the Beltway from the south northward into downtown Washington was redesignated I-395 in 1977. The small built portion from the north was converted into a park-and-ride lot. I-95 was then rerouted (and so signed) along the eastern side of the Beltway, with the I-495 designation left only along the western side. In 1989, the I-495 designation was returned to the eastern portion as well, with the highway co-signed as I-95 and I-495 along this route. The Beltway (here I-95 and I-495 together), four lanes in each direction, travels over the Woodrow Wilson Bridge over the tidal Potomac River between Alexandria, Virginia, and Prince George's County, Maryland. The Federal Highway Administration recognizes 0.11 miles (0.18 km) of the bridge as crossing the tip of the southernmost corner of the District of Columbia. However, signage for these boundary crossings is lacking. "Maryland Welcomes You" sign on the Outer Loop over the Woodrow Wilson Bridge. Well before this shoreline point, in actuality, the highway leaves Virginia at the low-water mark, briefly passes over an underwater corner of the District of Columbia, and enters Maryland for the rest of the Potomac River crossing. The Beltway (here I-95 and I-495 together) enters Maryland during its Potomac River crossing over the Woodrow Wilson Bridge, west of Forest Heights and National Harbor. After crossing the Potomac, I-95/I-495 immediately meets the southern terminus of Interstate 295, known as the Anacostia Freeway, a route that serves downtown Washington to the north, connecting in Washington to Interstate 695. The highway next intersects MD 210, a major north–south route from southern D.C. to Indian Head in Charles County, Maryland. Heading northeastward, the Beltway (I-95/I-495) interchanges with various local highways, including MD 5 and MD 4 on either side of Andrews Air Force Base, which the Beltway travels near its northern edge. (Both MD 5 and MD 4 extend westward into D.C., and southeastward into Southern Maryland.) Past the MD 4 interchange, the Beltway turns north through Glenarden, interchanging with MD 202. The Beltway then interchanges with US 50/unsigned I-595, a major highway from downtown Washington eastward to Annapolis, Maryland, and the Chesapeake Bay Bridge to Maryland's Eastern Shore. Both US 50 and MD 450 (which interchanges with the Beltway slightly northward) provide access to the New Carrollton Metro, MARC commuter rail, and Amtrak stations, and the New Carrollton area. Turning northwest, the Beltway then enters Greenbelt Park, intersecting the Baltimore-Washington Parkway (B-W Parkway) in the northeastern edge of the park. Just after the B-W Parkway, I-95/I-495 passes an interchange with MD 201, which connects to the southern terminus of the B-W Parkway at US 50 near the D.C. line. Now turned fully west, the Beltway runs through the northern edge of College Park, interchanging with the access roadway for the Greenbelt Metro and MARC commuter rail stations, then US 1. Beyond the US 1 interchange, I-95 separates from I-495 at the College Park Interchange. I-495 continues west, alone, on the Capital Beltway, while I-95 turns northeast towards Baltimore, Philadelphia, New York City, and Boston. The interchange includes access to a Park and Ride lot which was originally paved as part of I-95's route within the Beltway. Continuing west from the College Park Interchange, I-495 crosses into Montgomery County, Maryland, entering a heavily developed and populated area. Passing underneath MD 212 with no access, the route interchanges with MD 650 near the George Washington Cemetery. After bisecting Northwest Branch Park, the Beltway interchanges with MD 193 and US 29 south of Four Corners; the two interchanges are little more than 1/2 mile apart. Southbound US 29 is the main route into downtown Silver Spring, continuing into Washington. Squeezing past Argyle Park and Sligo Creek Golf Course, the Beltway interchanges with MD 97 northwest of Silver Spring, then follows an alignment formerly known as Rock Creek Parkway. [a] The route twists along the alignment, through and around Rock Creek Park, then interchanges with MD 185 near the National Naval Medical Center. Turning northwest, I-495 soon encounters the southern terminus of Interstate 270, which extends northwestward to meet I-70 in Frederick, Maryland. I-270 and I-495 split at a highly complex Y-junction, with two separate HOV connections to I-270's HOV lanes and separate ramps to and from MD 355 (formerly US 240). The old Rock Creek Parkway alignment follows I-270 north, while I-495 turns west and enters the only other six-lane segment of the Beltway still in existence; significant levels of traffic exit onto I-270 north, leaving the six-lane segment west of the split adequate. After these interchanges, the Beltway then narrows to eight lanes again. Turning sharply to the west, I-495 meets the Clara Barton Parkway along the north side of the Potomac River; this parkway provides a scenic route eastward into the western part of Washington, and westward toward the Potomac River's Great Falls. After this interchange, the Beltway soon crosses the Potomac Gorge into Virginia over the ten-lane American Legion Memorial Bridge. Immediately after crossing into Fairfax County, Virginia, I-495 encounters the western terminus of the George Washington Memorial Parkway at a trumpet interchange; the Parkway provides a scenic route to Arlington, Virginia, and downtown Washington. The Beltway then continues south, next interchanging with VA 193 south of Dranesville District Park, then reaches the extensive triangle of interchanges between I-495, the Dulles Airport Access Road, VA 267, and VA 123. The eastbound Dulles Access Road here also provides access to I-66 for Outer Loop Beltway traffic. The former interchange with the toll road (VA 267) is a directional interchange, while the latter is a cloverleaf; the entire complex occurs east of the Tysons Corner business district. Now running south, the Beltway interchanges with VA 7 (Leesburg Pike) east of Tysons Corner; passing Dunn Loring to the east, I-495 soon reaches the complex interchange with Interstate 66, which extends westward to I-81 in the Shenandoah Valley near Strasburg, Virginia, and eastward to Arlington and downtown Washington. In a similar design as the I-270/I-495 interchange, dedicated HOV connections exist between I-495 and I-66, with many reversible and other directional ramps providing the remaining connections. There is no access between the Outer Loop and eastbound I-66 at this interchange. Instead, Outer Loop traffic must use the eastbound Dulles Access Road exit 3 miles (5 km) to the north in order to reach I-66 East. [b] There are multiple ramps from I-66 east to the Inner Loop, with one ramp exiting from the left side of I-66 east and the other exiting from the right. The Dulles Access Road leads to Washington Dulles International Airport, which then changes over to the Dulles Greenway and ends at Leesburg. South of the I-66 interchange, the Beltway crosses under US 29 and VA 237 with no access, then encounters a large braided interchange between I-495, US 50, and two local roads; the direct interchange between I-495 and US 50 is a full cloverleaf, while the braided local interchanges between I-495, US 50, and the local roads are modified SPUIs. The entire complex is bounded on the northeast side by Fairview Lake and on the southwest side by an office complex. Continuing due south, the route then interchanges with Gallows Road, then skirts the eastern edge of Mill Creek Park before interchanging with VA 236 southwest of Annandale Community Park. Running along the eastern edge of Wakefield Park, the Beltway turns southeast and interchanges with VA 620 before turning east near Flag Run Park and entering Springfield, meeting the Springfield Interchange with I-95 southeast of the Shirley Industrial Complex. I-95 joins the Beltway within the Springfield Interchange. I-495 also meets the southern terminus of Interstate 395 within the same massive interchange complex. Running due east away from the interchange, crossing to the south of Backlick Stream Valley Park, the Beltway (now I-95/I495) interchanges with VA 613 a mile east of the Springfield Interchange. Continuing east, the Beltway encounters a diamond interchange with a connector road linking to Eisenhower Avenue, which parallels the Beltway for a short distance. Skirting the northern edges of Loftridge Park and Burgundy Park the two routes enter Alexandria and soon reach VA 241, a direct route into the city, currently under major reconstruction. Within the interchange, the Beltway nears the western approach to the Woodrow Wilson Memorial Bridge. Virginia welcome sign on the Inner Loop over the Wilson Bridge. A short stretch of the bridge just before this sign is in the District of Columbia. Continuing east the two routes encounter US 1, a major north-south highway providing access to Alexandria, Arlington and downtown Washington, as well as various points south in Fairfax County, Virginia. Finally, beyond this complex interchange, I-95 and I-495 together cross Alexandria's Jones Point Park and exit Virginia via the Woodrow Wilson Bridge. The idea of building a highway around the Washington suburbs had been discussed at least since 1944, when Fred W. Tummler, director of planning of the National Capital Park and Planning Commission, proposed an Inter-County Metropolitan Freeway. The Senate Public Works Committee backed the idea of building the highway in 1951, asking the Public Roads Bureau to prepare plans for the highway. Backed by Senator Francis Case of South Dakota, the plan called for the highway to begin in Beltsville at the nearly completed Baltimore-Washington Parkway, continue west through Silver Spring and Bethesda, cross the Potomac River over a new bridge, head south near Tysons Corner and Falls Church, turn east by the Shirley Memorial Highway, and end at Route 1 in Gum Springs. 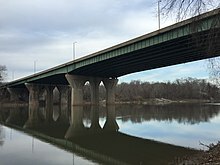 A 1952 amendment called for continuing the highway past Alexandria, over the Potomac River on a new bridge, and reconnect to the Baltimore-Washington Parkway in Maryland. By December 1952, the plan had evolved into a highway that fully encircled Washington's suburbs. The highway was intended to reduce traffic and also to offer an alternative route for the military in case of emergency. The federal government gave final approval for the construction of the Capital Beltway (also known as the Circumferential Highway in the planning stages) on September 28, 1955. The first section of the 64-mile (103 km) long Beltway (including the Woodrow Wilson Memorial Bridge over the Potomac River) was opened on December 21, 1961; the highway was completed on August 17, 1964. There were signs stating that to continue on the Beltway, you had to get off at the next exit, when all you really had to do was keep going straight. Lots of resistance from bureaucrats, but eventually we got dual I-95/I-495 signs on the eastern half of the Beltway. In 1989, the I-495 designation was restored to the eastern portion, making it a dual I-95/I-495. Traveling clockwise, the Beltway is designated as the "Inner Loop"; traveling counter-clockwise, it is designated as the "Outer Loop". This parlance too has led to its own confusion, with unfamiliar motorists imagining two separate, distinct highway alignments, one some distance inside the other. At entrance ramps to the Beltway and on the on-highway signage, "Inner Loop" and "Outer Loop" shields are posted in conjunction with the route marker shields, although the terms are not emphasized in signage. The Beltway was originally envisioned as primarily a bypass for long-distance eastern seaboard traffic to avoid driving directly through Washington. However, the explosive growth both of housing and business in the Washington suburbs following the Beltway's completion quickly made the Beltway the area's "main street" for local traffic as well. Numerous large shopping malls, community colleges, sports and concert stadiums, and corporate employment centers were purposely built adjacent to the Beltway, and these added greatly to the traffic, as has the passenger growth of regional airports accessed by the Beltway. The formerly more affordable price of housing in Southern Maryland versus Northern Virginia, also led tens of thousands of commuters to live in Southern Maryland and commute on the Beltway to Virginia. The newer Fairfax County Parkway in the 1990s helped ease some traffic on the Virginia beltway; however, various proposals to build another complete outer beltway in the outer suburbs has not gotten off the ground, because local governments in Maryland object to building additional Potomac River crossings as well as destroying protected "open space" and creating sprawl. The College Park Interchange is the informal name for the northern interchange between I-95 and I-495 in College Park. The interchange was partially opened, along with the connecting segment of I-95, in 1971, completing I-95 between the Baltimore Beltway and the Capital Beltway. As originally planned, it was designed with the idea that mainline I-95 through traffic would continue straight through the interchange and south into Washington D.C. as the Northeast Freeway, joining the North Central Freeway within D.C. and running south towards the central business district. When the D.C. government canceled its segment of I-95 in 1977, I-95 was rerouted onto the eastern half of the Capital Beltway, which lost its designation as I-495 (this was restored in 1989, forming a concurrency of I-95 and I-495 on the eastern half). As a result of this rerouting, the interchange was placed under considerable pressure to cater for a traffic flow that it was not designed to handle. Originally, travelers from southbound I-95 to the Inner Loop had to traverse the one-lane cloverleaf ramp in the southwest quadrant of the interchange; after exiting the ramp, traffic then had to weave through Inner Loop traffic headed for US 1. This unsafe condition was rectified by November 1986, when the flyover from southbound I-95 to the Inner Loop was constructed for I-95 southbound through traffic; the existing one-lane cloverleaf ramp was retained for access to the new C-D lane on the Inner Loop within the US 1 interchange, to segregate through traffic from southbound I-95 and local traffic for US 1. The stump end of the interchange was also modified into its present configuration, and the Park and Ride was built. Despite numerous widening projects during its history, heavy traffic on the Beltway is a continuing problem. The Woodrow Wilson Bridge—where eight lanes were squeezed into six—was particularly onerous, with miles-long backups daily during commuter rush hours and on heavily traveled weekends. Relief for this bottleneck came on May 30, 2008, when the 12-lane replacement bridge opened to traffic in both directions (the six-lane span carrying Outer Loop traffic had opened in June 2006). Two of the lanes on the Wilson are being held in reserve for future use as bus rapid transit or rail transit. Two intersections on the Capital Beltway are ranked in the top 20 on a study of the "worst bottlenecks in the nation." They are the I-495 at I-270 interchange in Montgomery County, Maryland, ranked third overall, which receives 760,425 cars daily, and the College Park Interchange in Prince George's County, Maryland, ranked 11th, with 340,125 cars. The Springfield Interchange, where I-395, I-95, and I-495 meet, was previously ranked fifth worst in the nation, but recent improvements have taken it off the top 20. Local commuters refer to the Springfield Interchange as "The Mixing Bowl," although this designation is reserved by highway officials for the even more complicated interchange complex adjacent to The Pentagon on the original Henry G. Shirley Memorial Highway (currently better-known as Interstate 395) at State Route 27 in Arlington. In April 2005, the Virginia Department of Transportation signed an agreement with two private companies to build high-occupancy toll lanes on the stretch of the Beltway between Springfield and Georgetown Pike. Construction began in 2008. Maryland officials are considering such lanes on their segment of the Beltway, as well as other major commuter highways in the state. Locals who disapprove of these projects have nicknamed them "Lexus Lanes" because of the potential high price for using the lanes in exchange for bypassing congestion. These new lanes are one stage of a controversial project to widen the beltway, with the second stage involving widening the beltway to 12 lanes; opponents have called for various alternatives to this project (as well as the controversial Intercounty Connector project) which would divert many vehicles off the northern beltway. The Maryland Transit Administration's proposed Purple Line light rail transit line is just one example. The Beltway has been improved since it opened. The American Legion Bridge was expanded by two lanes. HOV lanes were added between River Road and the I-270 Spur in Montgomery County, Maryland. The interchange between I-95 and the Beltway in Prince George's County, Maryland was originally designed to be a cloverleaf to allow I-95 to extend southward toward the District of Columbia. After I-95 was realigned onto the Beltway, a flyover ramp was built to allow I-95 through traffic to have two high-speed lanes. The interchange between U.S. Route 50 and I-95/I-495 in Prince George's County, Maryland was upgraded from a simple cloverleaf to a hybrid turbine interchange. In the Beltway's original configuration, I-295 and Indian Head Highway had separate interchanges. As a result, north-south traffic between I-295 and Indian Head Highway was forced to merge onto a congested section of the Beltway for approximately one mile. As a congestion relief measure, I-295 was extended over the Beltway and continued parallel to it so that the two highways were directly connected independent of the beltway. However, these interchanges were redesigned and rebuilt to accommodate the expansion of the Wilson Bridge and the construction of dedicated ramps to National Harbor. In January 2018, Maryland State Democratic Sen. Joanne Benson of Prince George's County proposed legislation (Senate Bill 55) to increase the speed limit of the Maryland section of the Beltway from 55 to 70 mph, in a bid to reduce traffic congestion on the Beltway. The Springfield Interchange in Virginia completed reconstruction in 2007. The eight-year, nearly $676 million project worked to eliminate weaving among local and long-distance traffic between I-95, I-395, the Beltway, and State Route 644. The Woodrow Wilson Bridge underwent reconstruction in a major project that began in 1999; it now provides express and local lanes for both the Inner and Outer Loops. The new Wilson Bridge is higher and wider than the original 1961 span, which was demolished in 2006. The Outer Loop span opened in June 2006, and the Inner Loop span opened in May 2008. Also, in association with the Wilson Bridge project, the Telegraph Road and U.S. 1 interchanges (exits 176 and 177) in Alexandria, Virginia were rebuilt. The I-295 and MD 210 interchanges (exits 2 and 3) in Maryland were rebuilt as well. These improvement lasted through 2013. The Branch Avenue (Maryland Route 5) Interchange was also improved. 495 Express Lanes (HOT lanes) under construction at the I-495 interchange with Route 123 in Tysons Corner. At the left is the elevated ramp to access the HOT lanes from Route 123 via Westpark Drive (Tysons Corner). In the background is the Silver Line viaduct. The Virginia Department of Transportation authorized a public-private partnership to construct high-occupancy toll (HOT) lanes in Northern Virginia. The project added two lanes to I-495 in each direction from just west of the Springfield Interchange to just north of the Dulles Toll Road, and included the replacement of more than 50 bridges, overpasses, and major interchanges. Drivers of vehicles with fewer than three occupants are required to pay a toll to use the lanes. Tolls change dynamically, with higher tolls charged during periods of heaviest congestion. Drivers using the HOT Lanes are required to carry an E-Z Pass transponder to allow electronic toll collection, eliminating the need for toll booths. Tolls are waived for buses, carpools of at least three people, motorcycles, and emergency vehicles with an E-Z Pass Flex transponder set to the "HOV ON" configuration. If more than a specified number of carpools or buses use the lanes, Virginia must pay the tolls for the excess vehicles. The original scope of the HOT project is covered by a fixed-price $1.3 billion contract between concessionaire Capital Beltway Express LLC and contractor Fluor-Lane LLC. The partnership has proposed extending the scope of the project to north to the Potomac River. In 2004, Transurban (USA) Development Inc. joined the Fluor team to serve as concessionaire and long-term operator of the HOT lanes. After a competitive procurement, the team was selected to deliver and operate the new HOT lanes. After a series of public meetings and environmental studies, the project was approved and funded in 2007. Construction began in the summer of 2008. The Express Lanes were opened for public access on November 17, 2012. In September 2017, Governor Larry Hogan announced a plan to widen the portion of I-495 in Maryland by four lanes, adding express toll lanes to the median, as part of a $9 billion proposal to widen roads in Maryland. The project would be a public-private partnership with private companies responsible for constructing, operating, and maintaining the lanes. Exit numbers on the Beltway have gone through several iterations. Originally, all exits on the Beltway were numbered sequentially in a clockwise direction, starting with exit 1 for US 1 in Alexandria. After the eastern half of the Beltway was renumbered in 1977 as Interstate 95, exits on the Maryland portion were renumbered to the current format, counterclockwise with exit numbers assigned to mileposts. This caused problems because there were some exits that had the same number in Maryland and Virginia. Around 2000, this problem was solved by renumbering all of the Virginia exits. The exit numbers between the American Legion Memorial Bridge and the Springfield Interchange—Interstate 495's intersection with Interstate 395 and I-95 in Virginia—became a continuation of the Maryland exit numbers from the Woodrow Wilson Bridge to the American Legion Memorial Bridge. The exit numbers between the Springfield Interchange and the Woodrow Wilson Bridge became a continuation of the exit numbers of I-95 in Virginia; such exit numbers are much higher than those on the rest of the Beltway, but continue to increase in the counterclockwise direction. The counterclockwise numbering on the Capital Beltway is a rarity, as most similar loop highways, like the Baltimore Beltway, have their exit numbers/mileage set in a clockwise arrangement. The entire route is in Fairfax County. All exits are unnumbered. ^ Not the extant parkway in Rock Creek Park within D.C.
^ If a driver gets onto westbound I-66 at the Leesburg Pike (SR 7) entrance, the only choice for getting to northbound I-495 is to take I-66 west to the Nutley Street exit and then get on I-66 east. A similar situation occurs for going from the Dulles Access Road at Chain Bridge Road (SR 123) to southbound I-495, where it is assumed that the driver will know to continue along SR 7 or SR 123 directly to the Beltway. ^ Mileposts do not reset at the state lines. ^ a b The Woodrow Wilson Bridge crosses through the District of Columbia for approximately 300 feet (91 m). ^ Korr, Jeremy L. (August 15, 2004). "Memory Lanes". The Washington Post. p. B2. ISSN 0190-8286. Retrieved February 11, 2008. ^ "Miscellaneous Interstate System Facts". Federal Highway Administration. April 6, 2011. Retrieved August 28, 2013. The shortest Interstate route segment is I-95 in the District of Columbia which is 0.11 mile long. ^ Reporter of Decisions (October 2003). "Syllabus: VIRGINIA v. MARYLAND" (PDF). Supreme Court of the United States. Retrieved December 8, 2014. ^ Shaffer, Ron (June 25, 2006). "After 20 Years of Columns, Checking the Rearview Mirror One Last Time". The Washington Post. ISSN 0190-8286. Retrieved May 5, 2010. ^ Special Committee on U.S. Route Numbering (June 10, 1991). "Report of the Special Committee on U.S. Route Numbering to the Executive Committee" (PDF) (Report). Washington, DC: American Association of State Highway and Transportation Officials. Archived (PDF) from the original on October 16, 2017. ^ "The Beltway". Coalition for Smarter Growth. Retrieved August 24, 2012. ^ "Hit the gas: Md. lawmaker wants to up speed limits on Capital Beltway, I-270". Washington, DC: WTOP-FM. January 19, 2018. Retrieved January 22, 2018. ^ "Proposal Would Boost Beltway, I-270 Speed Limits to 70 Mph". Washington, DC: WRC-TV. Retrieved January 22, 2018. ^ "Virginia HOT Lanes". Fluor-Transurban. Retrieved December 8, 2008. ^ "How HOT Lanes Work". Fluor-Transurban. Retrieved May 29, 2011. ^ "Virginia HOT Lanes Project Info". Fluor-Transurban. Retrieved September 30, 2010. ^ "Turnkey Lump-sum Design-Build Contract" (PDF). Retrieved December 23, 2010. ^ "Project Background". Retrieved October 15, 2012. ^ "Hogan proposes $9B plan to add new lanes to Beltway, 270 and BW Parkway". Washington, DC: WTOP-FM. September 21, 2017. Retrieved September 21, 2017. ^ Highway Information Services Division (December 31, 2013). Highway Location Reference. Maryland State Highway Administration. Retrieved June 24, 2010. ^ Traffic Engineering Division (2008). "Daily Traffic Volume Estimates Jurisdiction Report: Fairfax County" (PDF). Virginia Department of Transportation. Retrieved June 24, 2010. ^ Traffic Engineering Division (2008). "Daily Traffic Volume Estimates Jurisdiction Report: Arlington County" (PDF). Virginia Department of Transportation. Retrieved June 24, 2010. ^ Google (January 17, 2016). "Capital Beltway" (Map). Google Maps. Google. Retrieved January 17, 2016. ^ Google (January 17, 2016). "Capital Beltway High Occupancy Toll Lanes" (Map). Google Maps. Google. Retrieved January 17, 2016. Wikimedia Commons has media related to Interstate 495 (Capital Beltway). Dangers of Driving on the Capital Beltway & Washington D.C. This page was last edited on 30 March 2019, at 20:40 (UTC).